Belgrade non-governmental organisation Atina has been fighting against human trafficking and all forms of gender-based violence since 2004, and dedicates a special place in their programmes to the assistance to refugees, and the protection and advocacy, especially of women and children refugees. In Kontrola leta, we talked with Jelena Hrnjak from NGO Atina. What is the current situation with refugees in Serbia? From the moment the countries, through which the refugees passed for the most part in this previous period, reached the agreement to close borders, the situation has changed drastically. What we are seeing in Belgrade, and in Serbia, is that in a certain way we returned to the period of a year, year and a half ago, to the period before the escalation of the refugee crisis. When we say we returned to that period, it means that in 2014 in Serbia there were sixteen thousand officially registered intentions to seek asylum. This is what the state managed to formally process, but unofficial estimations are three to four times higher. Also, in the year prior to 2014, that is in 2013, there were about five thousand people who expressed their intention to seek asylum. It is also among official data. During that earlier period, before last summer, we were also noticing a large number of people who have, in some illegal way, moved through our country with the help of smugglers. That is what we are seeing now, and what we guess will happen to a greater extent in the coming period, due to the restrictive measures which have been taken. What is currently happening is that we are receiving information from Greece that there are about fifteen thousand people there who expect to cross the border. They are exchanging various information among themselves, and saying that they will most likely, if they are not allowed to move, try to do it using alternative ways. What we know for sure is that on this so-called “no man's land” between Macedonia and Serbia there are four hundred refugees, and that in Preševo there are around six hundred refugees inside the reception centre. In Belgrade, there are around two hundred refugees, and in Šid, on the border with Croatia, four hundred of them. So, those are the persons who are currently here, and for whom an assessment is being conducted on whether they will continue their journey, or be returned. 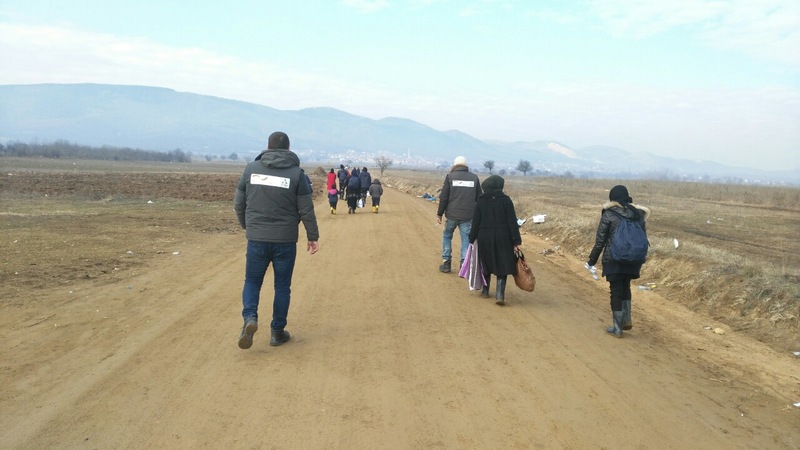 Practically, new plans are being made with regard to the new situation, but in any case there was no admission of new refugees in Serbia in the past several days. What is happening with the refugees who are now waiting to continue their journey? The situation now is quite different. It really differs from the period that we remember from several weeks ago. First restrictions happened precisely in that period, when only refugees coming from Afghanistan, Iraq, and Syria were allowed to pass. However, now, in the last few weeks, these measures gradually became more and more restrictive. They first denied entrance to persons who come from Afghanistan, and then allowed only those from Iraq and Syria who come from the cities directly affected by war, while all the others were denied. Also, those who stayed in Turkey for a longer period of time were returned, as well as those who did not have a passport or some other document. So, in fact, the number of people who have had the opportunity to pass through has been increasingly declining. Ever since the beginning of the refugee crisis, NGO Atina has been present virtually every day, twenty-four hours a day, in places where the refugees were present. We see a huge difference between the people who come now, and those who came before, and we actually call this the second wave of refugees, because the people who had been coming before had much better educational status, and more resources. Earlier, in August, September and October, refugees were telling us they are going for a better life, and today they tell us that they are going for a life. Practically, returning to the country of origin is not an option for them, and it is something they have a hard time accepting if you happen to suggest it to them. Are there humanitarian organisations in the field to help people and children? We in Serbia have established a complete support system consisting of: state institutions, international organisations, and civil society organisations. There are various organisations to provide various types of assistance, from distribution of humanitarian aid, through organisations such as Atina dealing with the practical protection of refugees and their rights. Atina is primarily dealing with the protection of those who have survived some form of violence, and who are among the refugee population. Gruesome photographs can be seen, primarily from the “no man's land”. The situation is more than difficult. How do you see it? The situation is difficult, and we believe it will become even more so. First, we believe that it is, in fact, impossible to stop these migrations. That comes from the experience we have had in the past several years. We think that the policies of the countries affected by this issue will become even more restrictive toward them, and that the greatest burden will actually fall on these people, and that is what we are particularly concerned about. We in Atina are also concerned about the fact that, with such restrictive policies, smuggling will flourish, and people will be at greater risk of being exploited, hurt, and of experiencing violence. This will either happen on “no man's land”, or there will be no liability of any individual country, so they will not be protected. They will find themselves in a situation where they are without documents, do not know the language of the country they are in, and the only contact with reality will be a smuggler who holds their lives and their safety in his hands, and that is what upsets us most. You surely have information whether there are persons in the field who are engaged in smuggling? It is enough to look at the statistics and you will see that yesterday, during the day, in Hungary one hundred and forty seven people who managed to cross the border were arrested. Look at the statistics, even official, and it will be clear whether the smuggling networks are working or not. What we definitely see are those larger groups of people here in Belgrade as well, coming from different sides. Preševo is not the only border crossing through which they can pass. As I already mentioned, there were many smuggling routes along various borders, along the border between Bulgaria and Serbia, and even between Serbia and Macedonia. It will be extremely difficult to prevent these illegal activities. What we definitely see as one of the greatest failures is the fact that these restrictive policies have not been followed by equally effective actions directed toward the suppression of smuggling. We hope that the response of the organs responsible for it will be in accordance with the policies adopted by Member States. Are you in contact with national and international institutions, since you are working together? What do they say about it and what are their intentions? Yes, we are in contact with organisations working directly in the field, and we are primarily dealing with the protection of refugees whom we come across, as well as the refugees who are currently located in various accommodation facilities in our country. Those are policies that belong to other spheres and areas related to the work of the Ministry of the Interior, Prosecution Office and others who prosecute criminal acts. The role of civil society organisations is not to deal with smuggling, nor to follow the smuggling flows in general. Our job is to deal with the protection of persons who are at risk, and who are in some way disadvantaged, so we are not in the position to make an evaluation of any kind. What we can do is confirm that we see people, that they are there, and that we know they came here through some ways we like to refer to as alternative. How important are information to the refugees? They are hungry and thirsty for information more than anything else, and that is what they need at any given moment. It is very difficult, because those information determine their future. The way in which you will say something to someone, and the way in which you will help the person, can be problematic. We also have a difficult time explaining all these restrictive policies to the refugees, as we do not understand why their rights are infringed in most cases, and why they are not allowed to move freely if they really have the right to do so. According to the laws of many countries, they are entitled to it, if their countries are in a situation they are obviously in, and it means that their lives are disrupted, their health and safety too, so in this case it is difficult for us to explain why there was a change in this situation now. Also, refugee communities, that is the communities refugees come from, differ. The dominant ones are those coming from Syria, and those coming from Afghanistan, and in most cases they listen to the so-called voice of their community. So, in the end, they will listen to what members of their community say to them, no matter what we tell them, and that is something we should all keep in mind. Does the state and its institutions ask for advice, given that you are in the field every day? Do you hold coordination meetings with state institutions? Yes, the role of the state in this whole crisis is to coordinate the activities of all actors. I think that our country also attends coordination meetings with other countries, and I think that they are led by some policies. It is obvious, given that a dominant effect occurred with the decisions of Austria and other countries to resolve this in their own way, so I believe that our country is also conditioned by decisions from the outside, and I think they are making decisions in that respect, which we now see in the field, and which reflects on the situation in Serbia. Given that you are dealing with the most vulnerable population - unaccompanied children - what is the situation like in that regard? Are there children you are working with, finding accommodation for, etc...? This is a particularly sensitive field, and one part of our system we are definitely not proud of. From previous experience of NGO Atina, the protection of children, and especially protection of children victims of human trafficking, was an extremely problematic field. This is so because the children protection system, and the way in which it is established, did not respond to the real needs of these children. The situation now is basically the same, because children who come from refugee population have completely different needs, different culture, language, tradition, religion, and the support systems and support programmes must be adapted to these children. We would evaluate the childcare system for those children who are travelling unaccompanied as inadequate in Serbia; it requires a lot of work, if we want to talk about some results, and the assessment of the best interest of these children and assistance to these children. Thousands of unaccompanied children passed through Serbia since the crisis escalated, and we actually see, based on those individual cases, all the powerlessness of our system and its inability to help these children in the best possible way. It also happened that these children simply run away from accommodation facilities, that they disappear. We would lose contact with them, and we feel that is not good. The biggest problem and difficulty is the fact that the system does not view these children primarily as children, but rather observes them through their migratory status, which should be of secondary importance, because under the Constitution and laws of our country, every child should be seen as a child and a special approach should be made in work with these children according to that. There is a series of other difficulties that prevent these children from exercising their rights and receiving adequate support, but I believe that it merits a special show where we can talk only about that. Are there some children who remained in Serbia and how does the state care for them? When it comes to NGO Atina’s experience, we have had several cases. We identified children victims of human trafficking among the refugee population over the past couple of years, and these children remained in Serbia for a longer period of time. We had two Afghan children, a boy and a girl, and the girl stayed in Serbia for thirteen months. We do not have information that more children stayed in Serbia for longer periods of time. In our programmes we had children, two girls from Afghanistan, who stayed together with their family, and who survived sexual violence here in Serbia by an Afghan gang. We had the opportunity to work with them for three months, but they did not make a decision to stay in our country. So, we currently do not have the information whether some children stayed here. Regarding the asylum system and other children who were in our country, there were some examples of children who even started school, but right now we do not have information on whether those children stayed here, or continued the journey with their family during this refugee crisis. How does the local population react to refugees? Thank you for this question. This is an issue that is certainly present, even among us. We have had a chance to read citizens’ comments in the media, and we were quite shocked and could not believe what our citizens think about refugees and this whole situation. There was a number of insulting comments, and even hate speech, particularly, for example, on some newspaper articles that talked about some of the refugees who will stay for a longer period of time, or about some of the refugees who were granted asylum here in Serbia, and decided to stay in Serbia. We see, in fact, that if a greater number of refugees happens to remain here for a longer period of time, we will need a harmonised response, an action that will include a wider range of actors who will help citizens become accustomed to this new fact. At the same time, it would help the refugees to overcome this period in the least painful way. But definitely: what we can see, even through the media, because we keep track of a lot of articles concerning this topic, is an extremely negative attitude. We would say a neutrality, in the sense that people in Serbia are not that happy when it comes to their position, economic situation, and that we have a lot of problems as a society and as a state. However, we really did not expect this kind of outburst that we have an opportunity to see at various websites and the media, which, in fact, calls for hatred and which suggests that if the refugees remain in Serbia we will face persistent struggle with the opening of a dialogue between the citizens and refugees. We believe the best solution for this would be joining of cultures, customs and traditions, but it is not for now. Those plans will be made in the near future, when we find out whether these people will stay longer with us or not.